“I do not want to have men and women on the streets, in the woods. I want emergency accommodations everywhere,” said French President Emmanuel Macron in July 2017. He set the end of the year as his target. While local authorities did open shelters for the homeless populations, in line with Macron’s pledges, the majority of displaced people are still sleeping outside with no shelter from the elements. They are subject to harsher realities than you or I could ever imagine. 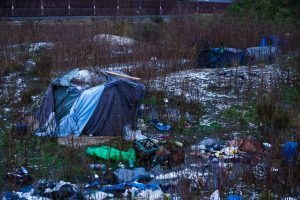 There are 1,000+ refugees — including 200 children — living rough on the streets and in wooded areas around Calais and Dunkirk. Only a small percentage are provided with accommodation and it is not offered every night, let alone throughout the whole of winter. A snow day was the first time the emergency accommodation centres opened. There are two centres in total; one takes in women and children, and the other is for men only. 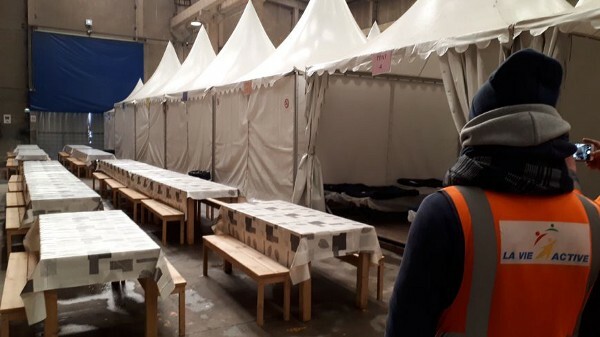 After several weeks of increasingly cold weather, it was only after L’Auberge des Migrants and Help Refugees spent the day applying pressure to the local prefecture that Calais city authorities decided to open these two centres. Men, women, children, the elderly and the sick; they all woke up that day covered in snow. It took that long, and some persuading, for action to be taken. This was in December, and the centre was only open a few days that month. There is no consistency with knowing when these centres will be open. Maybe tonight, maybe next week, maybe next month… Only the prefecture has the power to decide when they will open, and when they will close again. It then falls on the aid organisations to disseminate the mixed information provided, and at extremely short notice, making it even more difficult for people to access these shelters. The centres were open on more days in January, but it was still not enough. We are in the midst of the worst winter in years. In Calais, there is a ten year old boy sleeping outside. Ten years old and unaccompanied with no safe space to sleep or protection from the wind, rain and snow. French law requires opening emergency accommodation for all homeless people, including undocumented migrants, when the weather meets certain conditions. However, despite this, the criteria for opening the ‘emergency’ accommodation centres in Calais is a sham. Emergency accommodation in Calais. Photo: Radio France, Matthieu Darriet. The first centre is 200 spaces inside a industrial warehouse. I emphasise again that this accommodates only a minority of the displaced people in Calais. There is an inconveniently small time slot in which adults can arrive, and people are required to take specific buses from specific locations in order to gain entry. If you are lucky enough to bag yourself, expect to sleep on a cold stone floor in a small space cramped next to lots of other men. Those who do not sleep in the centres take refuge in the so-called “Jungle”, or the streets of Calais. They are the majority, and that majority face another night of sleeping — hiding — outside in sub-zero temperatures and in fear of the police destroying their sub-standard tents, stealing their belongings and/or tear gassing them during the night, which would leave anyone in an increasingly desperate situation. There is also a second centre only for women and minors (under 18 years old). This consists of 11 shipping containers. Literally just metal shipping containers. I believe they are the same ones that the children slept in during the eviction of the old Jungle. Ten of these containers have beds inside, and one container has toilets and showers. The situation is slightly better in Dunkirk as the ‘emergency’ shelter remains open throughout the day too. In December, the Mayor’s Office opened a gymnasium in the centre of Grande-Synthe which sleeps around 150 to 200 displaced people — predominantly from the Kurdistan region. Again, this was the result of aid organisations applying pressure to the local authorities in order to shelter people living rough in the surrounding areas. Refugee Community Kitchen carries out two food distributions every evening in Dunkirk — one at the gymnasium and one near a nature reserve where groups of Iranian, Pakistani, Sudanese and Afghani people live. We estimate around 70–80 people are still there, due to the gymnasium being at full capacity. Around 10 people live outside the gymnasium on cardboard boxes, where security and sometimes the police barricade the door from the inside with a stick to stop people coming in. Every time someone wants to leave and re-enter, they are forced to show a numbered wristband which permits them entry. The reality of accommodation in Calais, Winter 2017-18. Photo: Futuro Berg. A family pitched a tent around the side of the gymnasium. The rain beats down but it still takes some convincing to get the man on the door to allow them inside. The mother can barely stand up or even hold a cup of tea. I can’t tell you the amount of times a day you are shocked by the abhorrent and inhumane acts that take place here; in France, in Europe. How are you supposed to recover from a cold with no shelter? How are you supposed to heal a wound that is constantly wet from the rain? How are you supposed to stay sane when this is your reality? These people are being denied basic needs and deserve consistent accommodation during these winter months, with enough space for everyone, and throughout the day as well as night to ensure adequate protection of the most vulnerable people living in northern France. I bet there are plenty more empty, industrial spaces in Calais which could be utilised in this way. These people have fled war and destitution, and they deserve to be treated like human beings — as you would treat anyone who has suffered trauma, lost their home or is in need of compassion. The emergency accommodation centres have been open in Calais for the past week. Thankfully. This is the longest time they have been open consecutively, but what happens after? More people will face yet another brutal night outside, risking dying of the cold, and not only that, they are also subject to more tent clearances. We have witnessed the police come and take tents and tarps when temperatures have plummeted to -1 degrees. This piece was written by Georgia Iddiols, a volunteer in Calais, and was first published on The Warehouse – Calais’ Medium page. More than six months since Macron made his statement, hundreds of displaced people – in Calais, Paris and beyond – are sleeping on the streets. They have faced another winter without shelter, and are dependent on volunteers for support. If you are able to help us help them, please donate here. Thank you.